Most of your customers don’t walk around handing out their credit card information and home addresses to shady characters on the street. In fact, most people these days wouldn’t even give their email addresses to those they don’t really know. Ditto on the Internet. Before people will spend money, post comments, opt in to your mailing list, or take any action you want them to do when they arrive at your website, they need to feel safe. Safety leads to trust, trust to loyalty, loyalty to purchases and shares. Having the right legal language can get you to that place of trust with your visitors. It will also protect your profits. Oh, and by the way, some of that legal language is required by law. 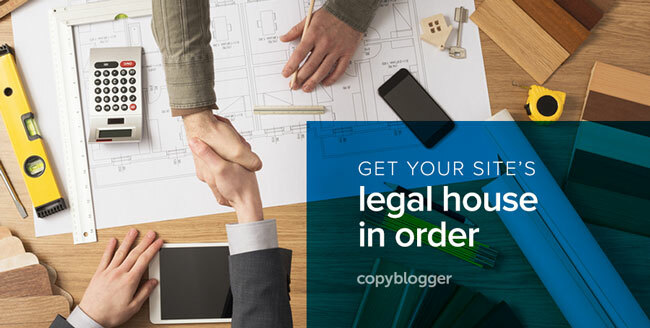 Here are five major elements your website needs in order to be legally legit. It tells your customers exactly what personal information you collect from them and what you do with it. It’s one of those elements required by law. Federal law, and in some cases state law, governs the manner in which you interact with your website visitors. Since we content marketers have opt-in forms on our websites — and since none of us have the ability to filter out visitors from California — we’re all required to have Privacy Policies. When you tell your visitors what information you collect from them and how you use it, it gives them confidence that your site is a safe and trustworthy place to play, share, and buy. Terms and Conditions are a contract you make with the visitors to your site. They set out the behaviors you expect from your visitors as well as what your visitors can expect from you. Because, as we lawyers like to say, Terms and Conditions save asses. Solidly drafted Terms and Conditions can limit your overall legal liability, protect your valuable intellectual property, and help you collect payments on time. Without Terms and Conditions, any disputes arising from the use of, or purchases from, your site will likely be more messy and expensive. As with Privacy Policies, the contents of your Terms and Conditions are dictated by your particular business. Although a Refund Policy is most likely a part of your Terms and Conditions, it’s such an important little bugger that we will discuss it separately. It might be wise to include your Refund Policy within your Terms and Conditions and also post it separately so that folks can find it easily. Refunds are typically just a part of digital commerce life. So, it’s good to have a crystal clear policy that is conspicuous to your visitors. Don’t want to offer refunds? That’s totally fine, unless you live in a place where it is, in many cases, mandatory (we’re looking at you, Mother Europe). The important part is that you are clear about your Refund Policy. It will help protect you from headaches and potential legal issues. The most important thing is to make your policy as clear and detailed as possible. If you don’t accept refunds at all, again, make it super clear. If a return is accepted, when can the customer expect to get his or her money back? Your Comment Policy is also likely a part of your Terms and Conditions, but it might be important enough to list separately on your site as well. This policy informs all of your visitors about how you deal with comments. Plain and simple. You can regulate your comments, so long as you do it consistently and without violating anti-discrimination laws. Yup, as a business owner, you are capable of discrimination. If you don’t have a clear, uniformly applied Comment Policy that describes when, why, and how you delete comments, etc., you can be sued for it. For the most part, you can decide what types of comments you will allow and what you will delete. The major exception is that you cannot discriminate based on certain protected bases like race, religion, gender, etc. There are more categories, and the lines between them can get blurry, but that’s a discussion for another time (over a glass of scotch, while wearing bow ties). What type of comments will you delete? Is there an appeal policy for deleted comments? A Copyright Notice, though not required, is a good way to deter visitors from “borrowing” your material. In fact, having a Copyright Notice and a general “Here’s how you may or may not use my material” policy conspicuously posted on your site will save you a lot of time, money, and heartache in the long run. In addition to this, if you want to grant permission for people to use certain aspects of your material, you should state that very clearly. Just remember, it’s important to be equally as clear about what’s allowed as what’s not allowed. Also, if you want to let people use certain parts of your material, make it clear that you still maintain ownership over it at all times. So there you have it, the five major components to help your website visitors feel safe and build trust. Having the right legal language posted will also protect you and your profits as you build relationships with your website visitors. Are there other steps you take to protect yourself and your creations? Rachel Rodgers is an intellectual property lawyer for innovative companies, from mobile app developers to luxury inns, who are disrupting their markets. While raising a toddler and on bedrest with baby #2, Rachel wrote the only entertaining business law resource for entrepreneurs called Small Business Bodyguard. Click here to download a free refund policy, comment policy, and advice disclaimer you can adapt and use today!